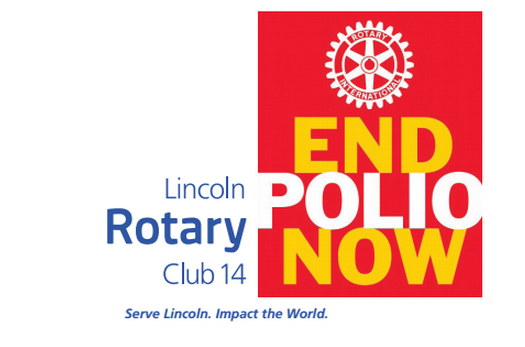 Thank you for your interest and support of our Bucket Brigade for Lincoln Rotary Club #14 Foundation and End Polio Now. Half of the money donated today will go toward our Club’s Foundation and half toward End Polio Now. Rotary is a worldwide network of inspired individuals who translate their passions into relevant social causes that change lives in communities. There are over 34,000 clubs all over the world and more than 1.2 million members. Lincoln Rotary Club #14 is the 14th Rotary Club in the world. Founded in 1910 it is Lincoln’s oldest service club. In 1997 our Lincoln Rotary Club #14 Foundation was founded to build an endowment to support charitable projects both locally and around the world. Since 1997 our Foundation has donated over one million dollars: 64% to over 90 different Lincoln Community agencies and projects, 10% to scholarships, 10% to international projects, and more than $60,000 toward the eradication of polio. You can see the impact of our contributions to the Lincoln community at the Sunken Gardens and at Elliott School Park and Playground. Rotary International’s role in eradicating polio began in 1979 in the Philippines when Rotarians goal was to provide vaccinations for all Philippine children. Six million children were vaccinated with the assistance of Rotarians. In 1985 Rotary International made a commitment to eradicate polio around the world. At that time polio existed in 125 countries. Today polio is restricted to three countries: Pakistan, Afghanistan, and Nigeria. It is still our goal to eradicate polio completely by 2018. For each dollar donated to End Polio Now the Bill and Melinda Gates Foundation will donate $2.